“Samsung is holding steady in its core markets of North America, Western Europe and South Korea, but the company is facing intense competitive pressure in China and India from rivals such as Xiaomi. 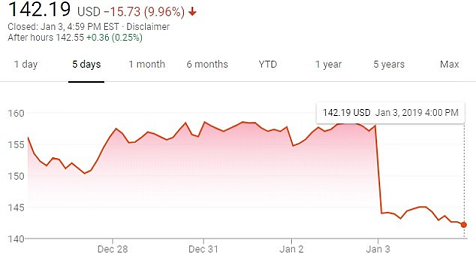 Apple volume grew 3%. Xiaomi’s growth is due to its focus on the sub-RMB1000 level ($160). 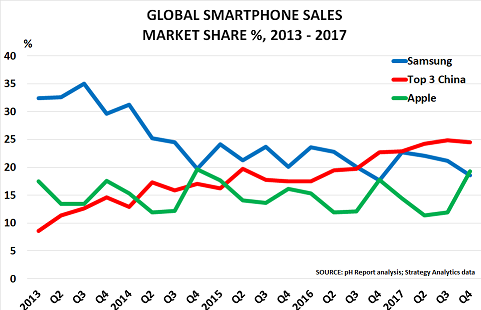 Its recent launch of cheap up-market phones will put more pressure on competitors and further drive consolidation in the market. Similarly, Xiaomi’s success in China highlighted the opportunity in the mass-market. Its market share jumped to 13% as it aimed to make a net profit margin of just 5% on its $100 – $160 phones. Now, both of these trends are reversing. Consumer spending is increasingly being driven by income, rather than borrowing. Companies are seeing interest rates rise on their debt: even worse, those who borrowed to take advantage of low US rates are seeing repayments rise as the US$ rises again. 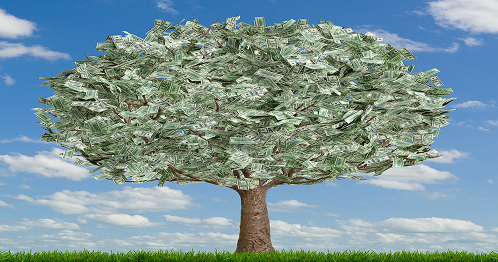 Investors need to be very careful about where they place their bets for the future. And companies need to check out their business partners’ strategies. Falling volumes and higher interest/debt costs will lead to a wave of bankruptcies. Most analysts are ignoring the changes underway in China. As with subprime, they will soon argue that “nobody could have seen this coming”. But in reality, there are always warning signs. 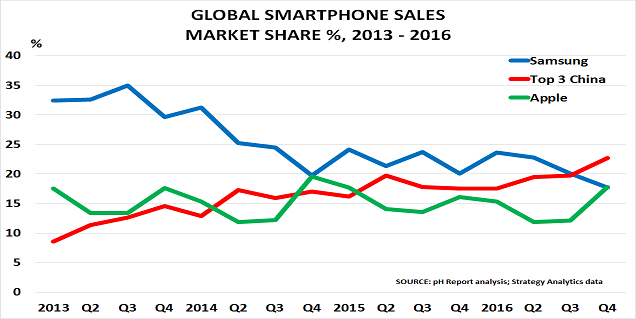 The global smartphone market has been the great success story of the stimulus era. Its paradigm shift is highlighting the likely “surprises” that lie ahead. 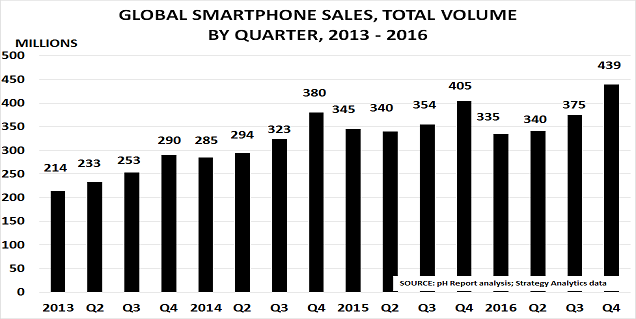 The post Apple, Xiaomi squeeze smartphone mid-market as sales plateau appeared first on Chemicals & The Economy. 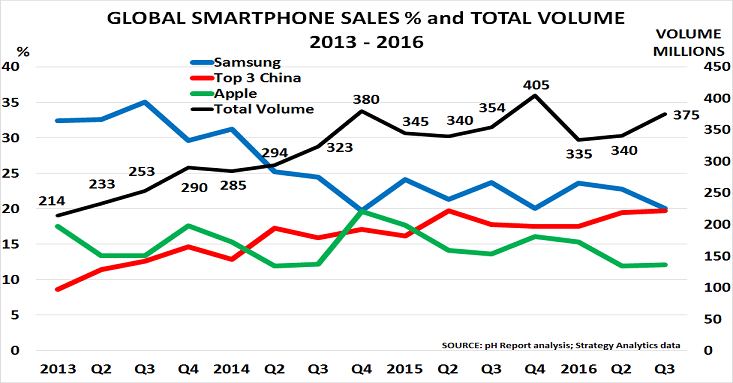 Even more revealing was that only Xiaomi of the Top 5 vendors increased their volume. 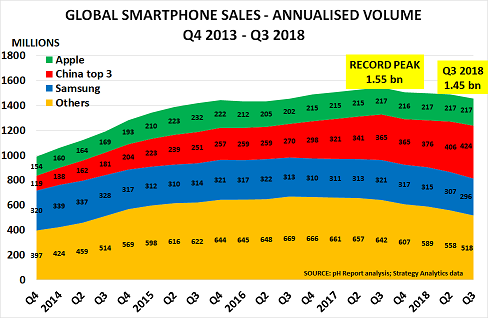 Apple lost 1m sales, Samsung lost 3m, Huawei lost 4m, whilst even OPPO only managed to maintain its volume. And Xiaomi only did well because they were recovering from their 2016 collapse, when their share crashed to just 3.35% from 5% in Q4 2015. 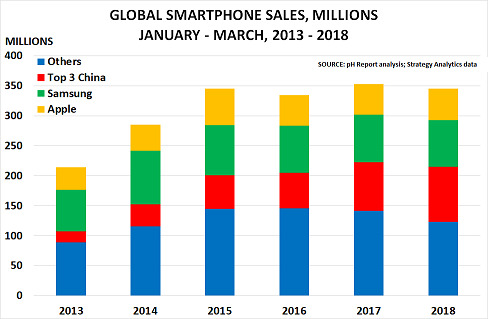 The rise of the Chinese vendors is great news for consumers, but very bad news for their competitors, as the third chart confirms. 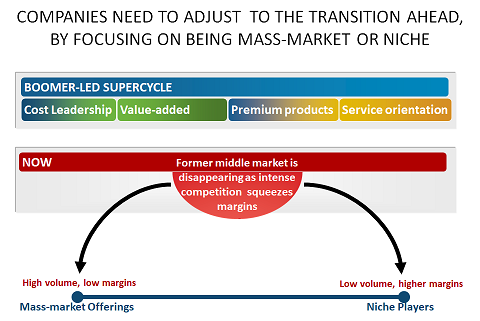 It highlights how revenues are now being squeezed for most vendors as the Chinese ramp up their volume. Only Apple has avoided the carnage by heading defiantly up-market, with its average handset price now close to $800. The issue is the very different nature of the smartphone market in the major emerging economies, where incomes are much lower than in the West and it is very rare for carriers to subsidise handset sales over the life of the contract. In India, for example, the typical smartphone sells for less than $200, whilst Apple has less than 2% of the market. 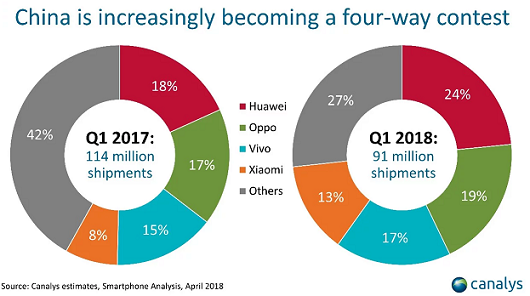 OPPO is likely to be particularly aggressive as it saw no growth in 2017 after doubling its sales in 2016, whilst Xiaomi is unlikely to risk a second slip-up on volume. 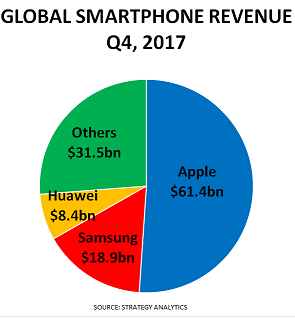 In turn, this makes it likely that Samsung’s mid-market positioning will come under major pressure from Chinese competition in key markets such as China and India. Apple must now intensify its efforts to move into application-based markets such as healthcare and other services. It has been building its position over the past 3 years, and has a vast cash-pile from its smartphone profits to fund the necessary shift away from hardware sales. 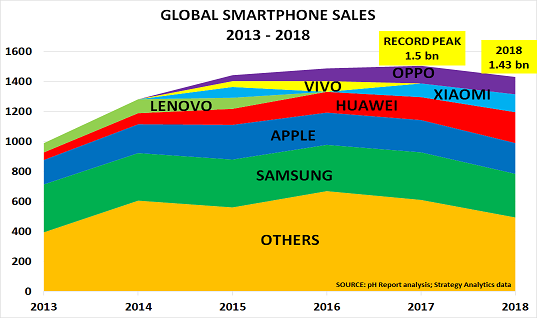 Samsung’s future looks less rosy, however, given that Chinese vendors have been able to produce smartphones for as little as $20 for the past 2 years. 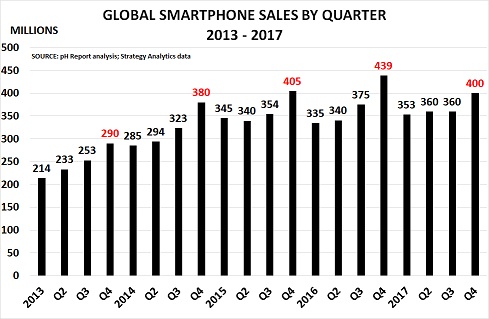 The post Global smartphone sales slide 9% in Q4, as China tumbles 16% appeared first on Chemicals & The Economy.